Lifting wheels on and off vehicles several times a day very quickly becomes physically demanding work for the body. We have developed a wheel lifter to facilitate this type of work. The lifter consists of a fork equipped with rollers, to easily get the bolt holes aligned in the right place, something that can be difficult if you try to do the job manually. The mast is offset so as not to be in the way and it has also been given a protective soft cover to keep the paintwork of the vehicle from being damaged. One of our wheel lifters is for passenger car wheels and the second one is for truck and bus wheels. 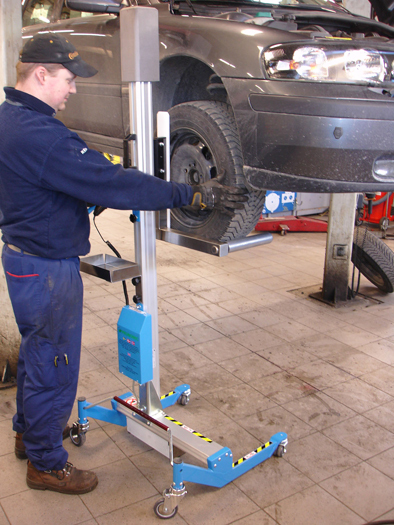 The lifter handles tires with a maximum weight of 175 kg.